The lemon yellow eggs of the Asian lady beetle are laid in clusters of about twenty. Asian lady beetle adults come in many colors and patterns. This lady has a big appetite. I have been watching Harmonia axyridis feast on herds of aphids on trees and shrubs this week, and their consumption is prodigious. In one grove of barberries, aphid populations went from roughly 10 aphids per leaf to zero in the span of 48 hours. Harmonia adults have been reported to consume more than 250 aphids each day, and the larvae may eat more than 1,500 during their development. In addition to consuming large numbers of aphids, they will feed on adelgids, scales insects, psyllids, and probably many other soft-bodied insects they encounter. Like many predators, they will eat each other. This species is largely arboreal, spending time in the canopies of many types of trees and shrubs found in our landscapes. They are highly beneficial when it comes to reducing populations of aphids. As early as 1916, deliberate attempts were made to introduce Harmonia into the United States from its aboriginal home in Asia. We are not exactly sure how or when the lady arrived, but by the mid-1980s, it was firmly entrenched in the southern states. By 1993, it was reported in several Mid-Atlantic States, including Maryland. It is now distributed from Florida to Washington State. The Asian lady beetle larva looks a bit like an alligator. Adults of this magnificent insect are highly variable in color and spot pattern. Their body color ranges from a pale orange to vermilion. The number of spots on the wing covers varies from 0 to 20. One diagnostic feature is a dark patch in the shape of an M just behind the head. 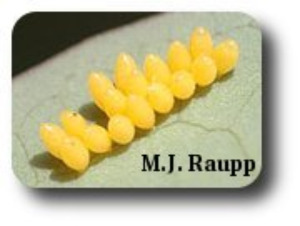 Females turn aphid meals into lemon yellow lady beetle eggs laid in clusters of about 20. The juvenile stages or larvae are mostly black but with two lateral orange stripes on the middle segments of their abdomen. These creeping youths resemble tiny, short-snouted alligators. The larvae take a week or two to develop and then transform into pupae. Within a few days, the adults emerge from the pupal skin and resume their conquest of the realm of aphids. So far, I have portrayed Harmonia as the ultimate femme fatale for many pesky pests of our landscape plants, but Harmonia also has a tawdry side. Some worry that she may be so aggressive that our less assertive native lady beetles may be displaced by her ecological escapades. The multicolored Asian lady beetle is also known as the Halloween lady beetle due to her nasty habit of invading homes in the autumn sometime around All Hallows Eve. We will revisit Harmonia axyridis again as bug of the week in September or October to learn more about the holiday visit she may be paying to your home.